Superbowl Sunday is the perfect way to get excited about everyone’s new favorite football team, the Patriots. It is inevitable that New England’s pride will compete in the Superbowl this year, so let’s make the most of it. There’s nothing more exciting than being around a bunch of people who are getting hyped to celebrate their team on one of the most special days in sports history. So bring out the wings, the friends and the Patriots pride. The Beanpot hockey tournament is the famous Boston University event that I am most excited for. I’ll never forget my tour of Boston College when they mentioned it, and then the next day I visited BU and started my journey into an everlasting yearning to beat the school I had just visited the day before. The Beanpot is a time for friendly competition, rivalry and Terrier pride. The Red Sox’s opening day in Fenway Park sounds incredible. With BU’s campus right on the edge of the Fenway neighborhood, students all around get excited for baseball. Whether the Red Sox are your rival, a new team to root for or your childhood favorite, there is nothing but joy buzzing around the air on this day. Boston is a sports city so I can’t wait to embrace all that is the Red Sox. 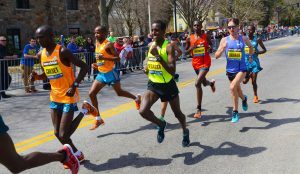 Marathon Monday, or the day of the Boston Marathon, has a special place in everyone’s heart. In 2013, this city was shaken by the tragedy of the marathon bombing, but the strength of Boston draws in students from around the world. This is a city that can take a tragedy, look back on it with grief, strength and a willingness to come together as a community and then celebrate all of those affected. This day is one of celebration — a celebration of Boston, the perseverance in the hearts of the marathon runners and of the community’s triumphs. I cannot wait to be a part of something so special. Commencement seems far away for everyone, no matter their year. This weekend shines a light on the accomplishments of the talented young men and women that have graced BU’s campus and are ready to move into the real world (or graduate school) and experience a life with one of the greatest degrees in the world. Whether you are saying goodbye to your closest friends, or moving on yourself, this weekend will be remembered in the hearts of friends and family forever. Congratulations to the Class of 2017! Boston University has so much to offer. So does Boston. Remember to stop and smell the roses sometimes.